Over the course of my life, I’ve had the opportunity to establish some commendable sea legs by traveling on vessels of all sizes and shapes, from a kayak in the East River in New York City to a 100-year-old steamship in Sweden, from a 12-foot fishing boat in Florida to an 880-foot cruise ship in the Caribbean. Each has its own special delights and appeal, but they all present opportunities to view your surroundings from a different vantage point. And when you leave the steering to someone else, enabling you to just sit back and enjoy, these boat rides become unforgettable experiences. These are my favorites. I drove my rental car onto the ferry in Wellington, New Zealand, engaged the emergency brake, and climbed upstairs to the outdoor deck. The Kaitaki is the largest ferry in the country, capable of carrying 600 cars and 1,350 passengers. It was the critical linchpin in my itinerary from the North Island to the South Island, and I was eagerly looking forward to enjoying the three-hour, 57-mile ride, praying for good weather — rough water and heavy swells from strong winds in inclement weather makes the strait one of the most treacherous sea voyages in the world, often disrupting ferry service. But I was blessed with a perfect day, allowing me to fully appreciate the journey. From its terminal, the ferry sailed into Wellington Harbor and around the hook of land occupied by the country’s capital. The city’s urban skyline gradually grew smaller as we entered Fitzroy Bay, with private homes atop rolling green hills and along sandy coasts replacing steel and glass skyscrapers. As we emerged into the expanse of Cook Strait, the water turned a deep cobalt blue and retained a lulling calmness throughout the entire crossing. 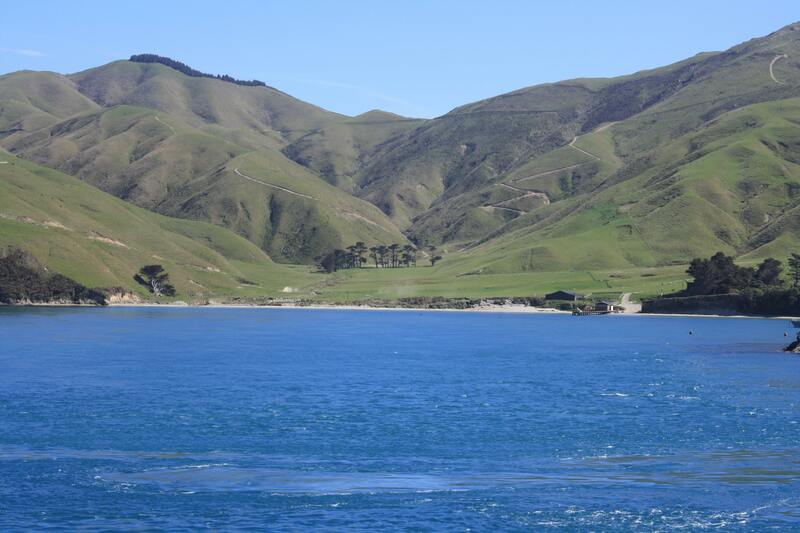 We entered Tory Channel, a narrow passage between the mainland of South Island and Arapawa Island, and then Queen Charlotte Sound. Deep green boscages and yellow-green carpets of grass covered the lands flanking us, and small rocky islands, some with a surface area for just a dozen or so birds, jutted out from the water. An occasional pleasure boat anchored in the placid waters of the countless protected coves and bays suggested a leisurely day of inactivity. The journey ended at the terminal in Picton, capping a perfect trip of stunning scenery in a country already blessed with an overabundance of it. The skillful gondolier, clad in his black and white striped shirt and black pants, gently lowered his rowing oar into the waters of the narrows canals of Italy’s iconic city and occasionally used his foot to gently kick off the wall of a building to steer his traditional flat-bottom boat. Above me, beautiful palazzi, crumbling apartment buildings, countless churches, and some of the city’s 400 bridges passed by in a dreamy haze of history and mystique, evoking an arcane aura of mystery and intrigue, long-gone wealth and enduring beauty. 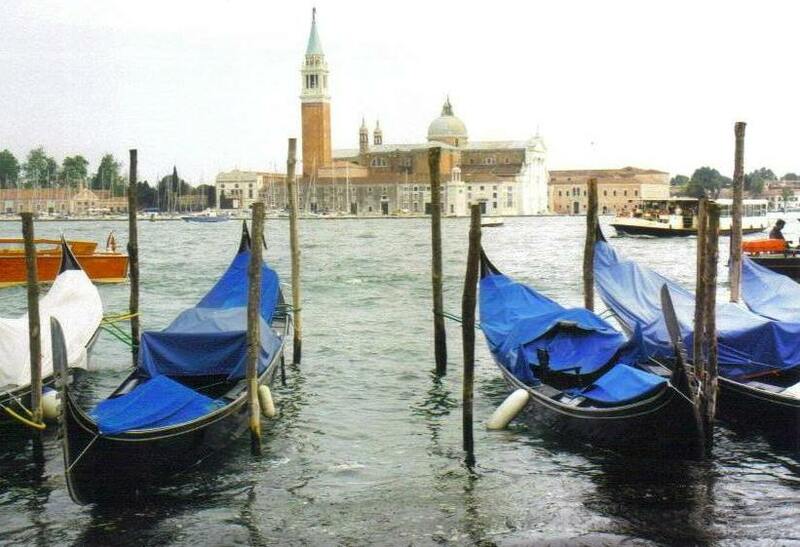 A gondola ride in Venice is arguably the most romantic boat ride in the world, especially when it weaves its way into the quieter ambagious backwaters, and one would be amiss not to indulge in this touristy yet practically required activity at least once in their life. But it comes at a price — about $100 for a one-hour ride. If you’re on a budget but still want to experience the city from its famed waterways, you do have two other economical options: You can hop on a vaporetto, the city’s waterbus, for a long and unforgettable (but often crowded) cruise down the entire length of the Grand Canal, from the city’s train terminal to the Piazza San Marco. Or you can step onto a traghetto — a stripped-down gondola that costs only a couple of euro and shuttles you from one side of the Grand Canal to the other. The trip is short, but it has the potential to give your some serious street cred: If you sit, you’ll be immediately identified as a tourist. I chose to stand and managed to balance myself without falling into the water when a motorized boat sped by and kicked up some waves, thus becoming a true Venetian. The drive from my inn in Queenstown to Milford Sound was long — 190 miles. But I hadn’t come to this far-off country to miss one of New Zealand’s top attractions just because of a little distance. Even before my 90-minute cruise began, I was enthralled. The distinctive Mitre Peak, a triangular mountain named after the headwear of Christian bishops, rose more than 5,500 feet before me, with leftover clouds from an earlier rainfall caressing the top. As we set sail on the nine-mile fjord on the southwest coast of South Island that leads out to the Tasman Sea, soaring mountains rose up on either side — some sheer rock, others covered with lush green vegetation, still others topped with patches of snow — reaching heights of up to nearly 4,000 feet. The rains (Milford Sound is one of the wettest places on earth, with about 250 inches of rain per year) had generated waterfalls that plunged into the fjord, with an occasional wind blowing some of the water away in a fine mist. Fur seals lounged lazily on exposed rocks, unconcerned by our infringement upon their idleness or by the propeller plane navigating the airspace between the peaks above. To me, this gorgeous stretch of uninhabited territory remains the undisputed champion in terms of a remarkable cruise on a fjord. Milford Sound’s greatest competition comes from more than 11,000 miles away in the Nordic country with the most dramatic landscapes. 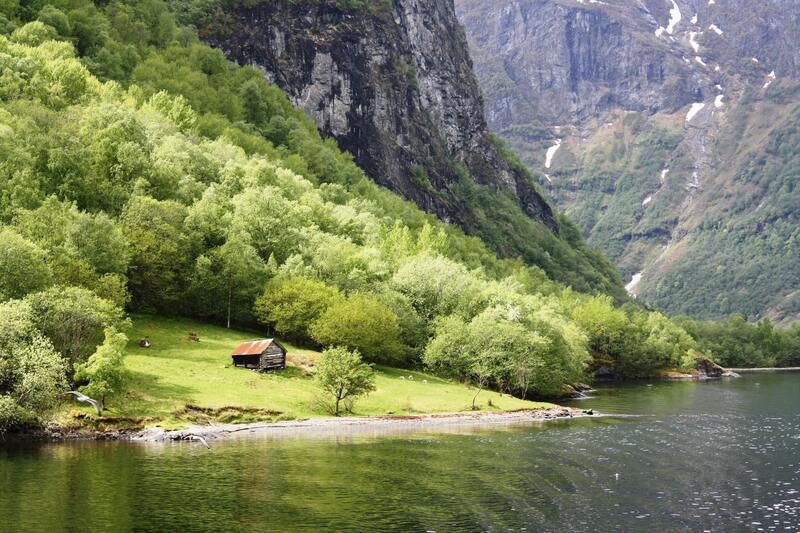 The highlight of the Norway in a Nutshell tour that I had booked is a two-hour cruise on the country’s renowned fjords. Standing on the deck of the ship that departed from the village of Gudvangen, I immediately fell in love with the 11-mile Nærøyfjord, a UNESCO World Heritage Site and the narrowest fjord in Norway. 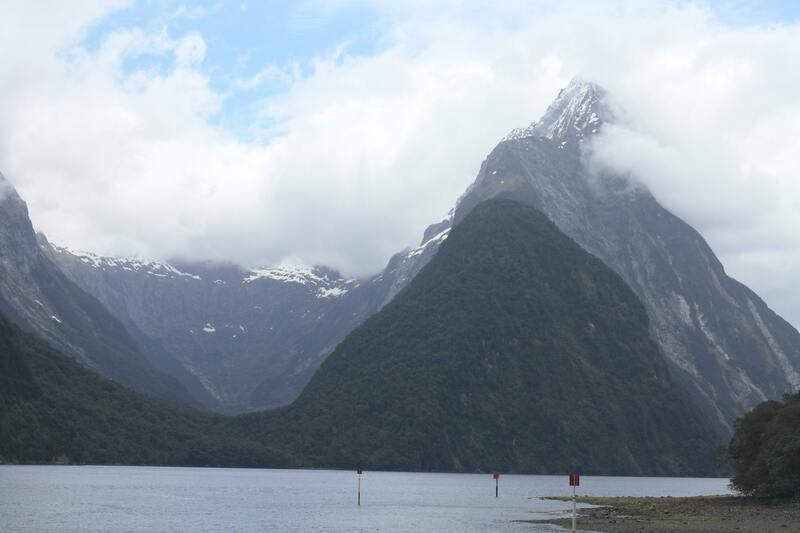 Like Milford Sound, it’s hemmed in by soaring mountains, still with snow atop their 4,500-foot-high peaks even in late May and an abundance of waterfalls of all strengths. At the end of Nærøyfjord, the ship hooked a sharp right into Aurlandsfjord, an 18-mile fjord that branches off of Sognefjord, Norway’s longest fjord and the second longest in the world (126 miles). The mountains flanking Aurlandsfjord are even higher, reaching up to 5,900 feet, and the perfectly calm water plunges to a depth of more than 3,000 feet. Occasionally, a little village popped up — Undredal (population: 112), for instance, which has Norway’s smallest stave church, and Aurlandsvangen (population: 777), which has a church built in 1202. I also spied a farmhouse way up on top of a mountain, and a little boathouse at the bottom. Before a road was built, the people who lived there had to climb between the water and the house; the uppermost leg of the trek was so steep that they had to use a ladder. The cruise terminated in the village of Flåm at the fjord’s end, and I had ample time to simply stand on the dock and be awed by the apotheosis of nature’s best work. Arguably the most beautiful commute in the world, the Washington State Department of Transportation ferries between Bainbridge Island and Seattle take only 35 minutes to cross the 9.5 watery miles between them. If not for the ferry, daily commuters would have to travel 92 miles in their car, each way, instead. For travelers like me who aren’t concerned about getting to a job on time, the ferry is a wonderfully relaxed way to reach the other side of Elliott Bay and experience an integral component of the Seattle fabric. 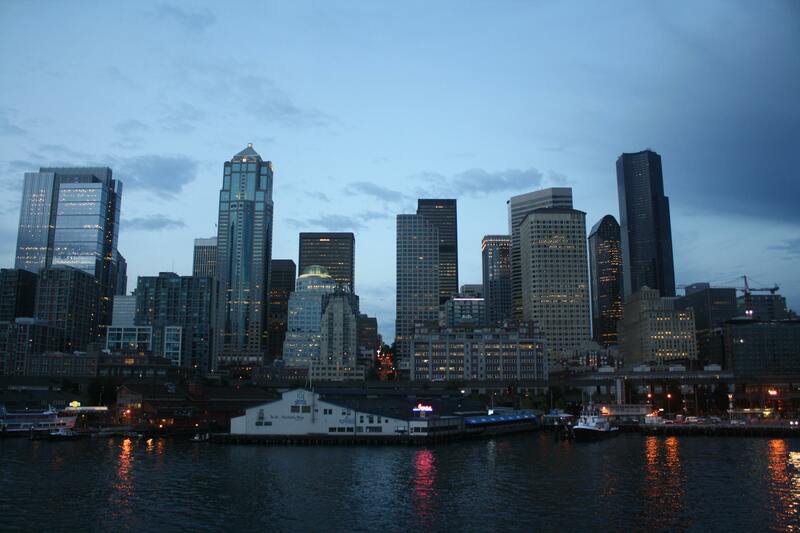 Departing from downtown Seattle late one weekday morning, I leaned against the railing on the top deck and faced west, into the breeze, as we sailed into Elliott Bay, part of the complex system of inlets, waterways, basins, and straits that compose Puget Sound. The gorgeous Olympic Mountains immediately came into view in the distance in a seemingly endless range of snow-capped peaks. Closer to land on the other side of the bay, the ferry glided by waterfront homes and marinas filled with gleaming white sailboats and ketches on its way into Eagle Harbor, between Wing Point to the north and Bill Point to the south. After disembarking, I spent a stress-free day in the vicinity of the terminal, meandering around the three-acre Waypoint Park and 5.5-acre Waterfront Park, browsing in the specialty shops and art galleries along the main road, and stopping into the Blackbird Bakery for a delicious cheddar-dill scone, lavender sugar cookie, and hot chocolate. I timed my return trip perfectly for the evening, when the setting sun casts wonderful colors across the sky and transforms the water into a golden bay, and when Seattle’s skyline lights up against the darkening sky with all its skyscrapers aflame with lights, from the Space Needle all the way down to the city’s most interesting building, Smith Tower. My daily commute on the New York City subway just got a little less bearable.